Stony Brook University's new telephone system will begin rolling out to the campus community in May 2016. Voice-over-Internet Protocol (VoIP) communications service. Unified communications technology will eventually allow you to seamlessly collaborate with other people, even if you are in separate locations. You will be able to quickly locate people by accessing an interactive directory, engage in text messaging sessions, and escalate sessions to voice calls or video calls if desired. Unified Messaging includes Voice-to-Text and Text-to-Voice. Presence will allow you to see if someone you're trying to contact is available. Stony Brook's VoIP system will bring you greater mobility. Hand off calls in progress from your cell phone to desktop phone and back to your cell phone for true mobility. This will allow you to take advantage of Wi-Fi technology where available, while saving on billed cellular minutes. When you originate phone calls from a non-Stony Brook device defined in your profile, the caller ID will appear to be sent from your Stony Brook telephone number. Publish your Stony Brook telephone number and choose which device you answer calls on, (cell phone, desk phone, home phone, PC/laptop, or tablet for one-number service). Share real-time documents with colleagues using Unify's Web collaboration tools. Create conference calls instantly using Conference Bridge. Simply distribute a call with a telephone number and PIN code. Search for co-workers by name through your device using the University Directory. 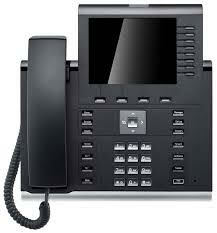 Handset-free dialing (all phones have a 'live' keypad which allows immediate dialing without lifting the receiver. This will automatically activate the SPEAKER option on the telephone or the headset (if being utilized). Call log/list will show an icon in the telephone display if you have a missed call(s). Once the list is viewed, the indicator will deactivate. Each call list may contain up to 30 entries. DoIT Data Network Services and Stony Brook Medicine IT installed a dedicated VoIP network. Unify arrived on-site to begin installing all of the VoIP core servers. DoIT Data Network Services began a pilot program with select DolT employees (mostly on the second floor of the ECC Building) to begin testing out the new devices. Once all phones have been deployed throughout campus and all users have been trained on how to use their new handsets, DoIT will then begin introducing the full complement of unified communications services offered by Unify. Training classes will be offered in advance, during, and after the rollout of both telephones and unified communications. VoIP (Voice over Internet Protocol) is not only a telephone system that runs over the campus data network, it also provides enhanced communication options. Once fully implemented, VoIP will allow Stony Brook to maintain one campus infrastructure instead of separate networks for voice and data. Unified communications (UC) is the integration of real-time communication services. As VoIP devices are installed, Stony Brook can start to take advantage of the Unified Communications (UC) features, including instant messaging (IM), presence, conferencing, unified messaging, and data sharing. 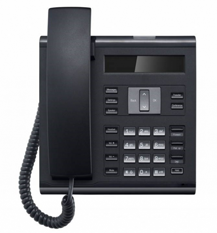 For example, UC allows accessing your voicemail via email, a cell phone, or land line. In addition, you can check someone's availability (presence) to see if you can still chat with them even if they are temporarily not taking calls. UC is not a single product, but a set of products to provide a consistent unified connection across multiple devices and applications. If you need to pull together a conference call with a Web or document shared screen with a group of colleagues at a moment's notice, UC allows you to combine various applications into one seamless stream. Why is Stony Brook migrating to VoIP and Unified Communications? SB is currently maintaining 20-year old legacy equipment which is operating at 85% capacity. The current support model is expensive and increasingly difficult to manage as equipment is rapidly approaching end-of-life. The existing copper infrastructure is failing and must be replaced. Copper wiring does not embrace campus or hospital best practices and offerings. The existing fiber network needs enhancements. We are now living in a mobile world. Our students, faculty, and staff have their own mobile devices and bring them to campus. They expect services to keep pace. Will I be forced to change my existing phone device? As the new system is rolled out across campus, all existing desktop devices will change to the new chosen vendor's offering for hard desktop phones, PC/laptop/tablet softphones, or primary cell phone. How will I know what my choices are for phone replacement? Prior to your department making the change, a member of the design team will meet with you and/or your department management team to determine device preferences. Will there be any formal training? Yes, prior to your department rolling out new devices, formal training classes will be offered, in addition to online and printed documentation. At the time of your department's installation, there will be trainers on-site to answer any questions you may have. How many devices do I have to choose from? Each department's leadership team will be able to choose a desk phone, cell phone, or softphone application for PC, laptop, desktop or cell phone. Desktop choices will be discussed during the initial department kick-off meetings. Can I use my own cell phone as my primary device? Yes, you can use your own cellphone as your primary device, however the device must be a smartphone, as an application must be installed to initiate communication to the Stony Brook system and to integrate in the e-mail environment. Can I save my current stored voicemail messages? No, not on the new system. If you wish to save any stored messages, you will need to record onto a separate device or create a wave file. Will there be any changes to the way we report service issues or request moves, adds, or changes? No, the procedure for reporting problems or to request changes will remain the same.